In the morning, while we move along the beaches of the South Zone of Rio to collect guests, you will hear about the interesting background of the neighborhoods of Leblon, Ipanema and Copacabana, discovering many things along the way, such as the origin of their names as well as learning a handful of the stories that happened in their streets. You will get a chance to learn about the writing of the Girl from Ipanema, learn the best spot to catch the sunset and the about the fashionable life of the Guinle family, back when they used to own the Copacabana Palace. After collecting all guests, the group will make its way Downtown, passing through the charming Botafogo’s shore where you will have the first glimpse of Sugar Loaf and hear about the fights between the French and the Portuguese back when Rio was nothing but wild. Then you will pass through the historic Laranjeiras neighborhood, which hosts the Guanabara Palace, the ancient home of Princess Isabel, who signed the Golden law (Lei Áurea) in 1888 to set the slaves free. You’ll have a chance to hear of the time when Brazil was already an independent country, but still, ruled by Portuguese emperors. After crossing the Santa Barbara tunnel, you will do a panoramic tour of downtown Rio, hearing all about the culture of Samba in Rio, while passing next to the Sambodrome and learning about the city’s early and later history before stopping at the Metropolitan Cathedral. At the Cathedral you will have some time to admire its unconventional pyramidal form with an internal diameter of 96 meters and a height of 80 meters. After a brief visit to the Cathedral, you will get back to the bus and get perspectives of the traditional Cinelândia Square with its historical buildings, the Municipal Theater. After crossing the historical Rio Branco Avenue, Via the Aterro do Flamengo, where you will hear about Brazil’s part in the Second World War as well as reliving the final battles between the Portuguese and the French, you will be taken to the neighborhood of Urca where one of the largest symbols of the city is located: Sugar Loaf. There, in addition to hearing about the origin of the Sugar Loaf’s name and its movie showcase in the 1979 007’s Moonraker, you will catch some of the best views on the city. You’ll travel all the way to the top in two steps by cable car. 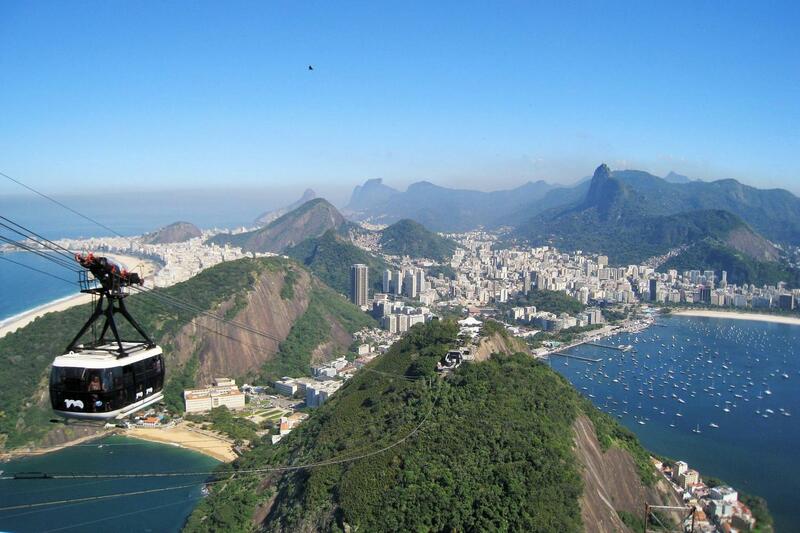 The first cable car takes you to Urca Hill, a vantage point 215 meters high for which already grants beautiful views of Guanabara Bay and its islands, Flamengo and Botafogo beaches, Santos Dummont Airport, the Rio-Niterói Bridge, Urca’s neighborhood and Corcovado Mountain. At Urca hill you will visit the first cable cars used at 1912, made by Germans, and the second ones, from 1972, made by Italians. From this stage, a second cable car takes you up to the top. When you get there, you will understand why Rio is considered one of the most beautiful destinations in the world. At 395 meters you’ll enjoy breath taking views from Copacabana beach, several beaches of Niterói and the Santa Cruz fortress, which was during the colonial times and Brazilian Empire the main defensive structure of Guanabara Bay and the Port of Rio de Janeiro. Explore Urca and Sugar Loaf hills for about 45 minutes before getting back to the bus. You can catch up great views of the charming city, see the native rainforest and take your best photo shots ever. You will see all the modern and natural beauties during this tour while thinking of the rich history you’ve just learned about Rio. Back on the bus, just relax and take a moment to behold Rio’s scenery while you let everything you experienced sink in, on your way back to your hotel. The smile upon your face is simply the consequence of a pleasurable morning tour you will never forget! If you select the option without tickets, we suggest you bring the amount in cash so it can be paid directly to the guide so you can be included on our voucher, otherwise you may have to enter the line for the purchase of tickets. The guide was nice, but he contributed very little in terms of perspective or information. This supposedly was to be done throughout the headsets, but we found this method inadequate. The narrative was quite general and did not follow the tour and tell us what we were seeing and the context behind it. A guided tour on the headset would have greatly improved the tour. Great tour and guide. Very happy with gray line. We went on to use themin Iceland too and again very happy!